Star Wars makes you stupid. Star Trek makes you smart. Explaining the precise psycho-mechanics underlying this “life transcending art” Caucasian cargo-cultery is beyond my intellectual capabilities. I”m on safer ground musing about those Star Wars fans expressing a rare degree of deep thinking following Carrie Fisher’s death. 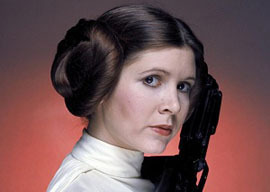 Fisher, most famous for her role as the series” “Princess/General Leia,” was much beloved, as evidenced by the outpouring of grief and, well, stuff like this after her passing. However, a nigh-on-Talmudic debate about Fisher’s afterlife sprang up simultaneously. Not about whether or not the late actress was headed for heaven or hell, of course”that stuff’s for grannies and hillbillies, amirite?”but a moral and ethical dilemma all the same. Because indeed, such technology exists, as Star Wars fans in particular are aware. The late Peter Cushing, who appeared in the original 1977 film, was digitally reanimated in the latest offering from the franchise. I was pleased to discover that there are still some in our post-everything world who found this ghoulish stunt disturbing. I”ve felt this way ever since I first saw “Fred Astaire” dance with a vacuum cleaner twenty years ago. Yes, this crass, clumsy commercial was okayed by his estate, as required by law (see: Lugosi v. Universal Pictures). Just because something is possible, and legal, doesn”t make it right. Perhaps my gut-level disgust at such spectacles is traceable to my Catholic upbringing. The West’s Judeo-Christian foundation is surely reflected in our reverential attitudes toward the bodies of the dead. Potentially boisterous visitors are reminded (with varying degrees of success, alas) that the USS Arizona and 9/11 memorials are burial grounds, for example. I”m enough of a Christian to find Israel’s ZAKA teams a bit of a muchness, but the impulse behind their quixotic mission is recognizably civilized. But picture the average unchurched American millennial or Gen-Xer, groping for the precise theological and philosophical language to express their horror at the prospect of turning deceased human beings into marionettes. I”m impressed and relieved that some of them are even trying, are still capable of revulsion at something besides counterfeit “racism” and microaggressions. Because the entertainment conglomerates who own the licenses to these lucrative franchises, and the other corporations that have stuff to sell, don”t possess such scruples. Like most stinging satires, 2013’s The Congress“a film about this very topic”will likely end up serving as more of an accidental instruction manual than a prophylactic. That revolting Fred Astaire ad was followed by similar ones “starring” “Gene Kelly” and, most recently and disturbingly, “Audrey Hepburn“; each time, objections were raised, but again, said critics struggled to express their misgivings. The word “soul“ even makes rare, welcome cameos in these stirring complaints, and I wonder”arrogantly, I know”if this was the first time said writer (especially”I”m so mean”the Time scribe) had ever had occasion to type that particular word before. Calling the Hepburn effort “the creepiest commercial ever made,” the best the L.A. Times columnist can manage is “Well, yick.” But still. Similar noises were made when Fast and Furious franchise lynchpin Paul Walker died in the middle of shooting entry No. 7, and “Weta Digital was asked to complete the sensitive and arduous task of reanimating” the star. But hey, the show must go on and he would”ve wanted it that way and whatever. Fans still flocked to the film. It is extremely labor-intensive and expensive to do. I don”t imagine anybody engaging in this kind of thing in a casual manner. We”re not planning on doing this digital re-creation extensively from now on. It just made sense for this particular movie. This state of affairs was predicted by Arthur C. Clarke and J.G. Ballard (“A kind of banalisation of celebrity has occurred: we are now offered an instant, ready-to-mix fame as nutritious as packet soup”) and lesser SF writers (see Joel Henry Sherman’s 1990 story “The Bogart Revival“). But none of these authors required particularly acute foresight to envision it.